-Sprinkle the granules of gelatin over the surface cold water or liquid. Use 1/4 cup, 60ml, or whatever quantity is called for in the recipe, per envelope. Do not dump them in a pile, as the granules in the middle won’t dissolve. -Let stand for 5 to 10 minutes. 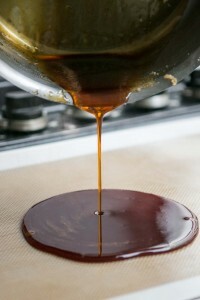 -Add warm liquid or heat gently, stirring until dissolved. To verify the granules are melted, lift the stirring utensil and make certain that there are no undissolved granules clinging to it. -Once soft, lift sheets from the cold water. -Wring gently to remove excess water, than add to warm liquid, the quantity called for in the recipe, stirring until dissolved. If adding to a cold mixture, melt the softened sheets in a saucepan or microwave over very low heat, stirring just until melted completely. Then stir in the cold mixture gradually. 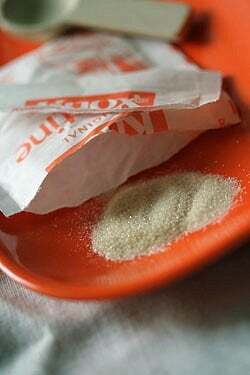 – One envelope of powdered gelatin (about 1/4 ounce) is about 2 1/4 to 2 1/2 teaspoons. -If the recipe calls for packets (ie; 2 packets), use packets of gelatin for measuring. -If the recipe calls for a specific amount (ie: 2 teaspoons gelatin), open the packets and measure the gelatin granules with a measuring spoon. -1 envelope of gelatin will firmly set 2 cups of liquid, enough to unmold a dessert. -1 envelope of gelatin will softly set 3 cups of liquid. You will not be able to unmold this type of dessert. -Both sheet and powdered gelatin should be dissolved in cold water. If hot water is used, granules of gelatin will swell on the outside too quickly, preventing the water from getting in to the center. -Don’t boil things made with gelatin. That can make the gelatin lose its efficacy. -Desserts made with gelatin should chill for at least eight hours, but twenty four hours is best. After twenty four hours, gelatin will not set any further. 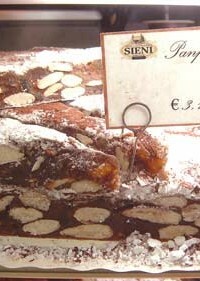 -Substituting sheet gelatin for powdered gelatin is perhaps the most controversial ratio known to the baking world. I’ve seen everything from 1 envelope equals 3, up to 5 sheets. Three-and-a-half sheets seems to work best for me. I use sheets that are 3-inches by 5-inches. 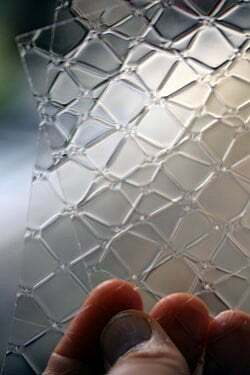 -Some people prefer to use sheet gelatin, claiming it has no odor and the gel sets finer. Another advantage is there’s also no chance of undissolved granules when using sheet gelatin. -Gelatin is graded by “bloom’, which is a measure of the stiffness and strength of the gelatin. (Developed by a Mr. Bloom.) Knox gelatin is 225 bloom, sheet gelatin (gold) is 200 bloom. -If you want something made with gelatin to set faster, chill the mold or container first. Also you can stir the mixture constantly in a metal bowl placed in an ice bath until it begins to set, then pour it into the mold or container. -Gelatin lasts forever according to the Gelatin Manufacturer’s of America. If the packet gives an expiration date, it has to do with a “degradation of the packaging.” So if the packaging is damaged or old, you may want to toss it and use a new batch. -Certain tropical fruits, such as pineapple, kiwifruit, and ginger, have an enzyme (bromelin) that can prevent gelatin for setting. 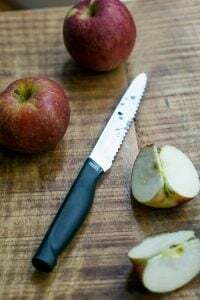 Heating the fruit completely through before using will destroy the enzyme. 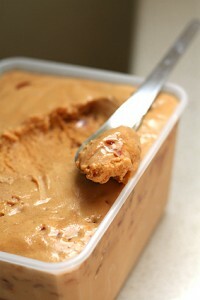 -Some folks add gelatin to sorbets to keep them softer when frozen. If so, for 1 quart (1l) of mixture, dissolve 1 teaspoon of gelatin in 2 tablespoons or so of the cold sorbet mixture and let soften for 5 minutes. Warm a small amount of the sorbet mixture and pour it into the gelatin, stirring until dissolved, then mix the gelatin back into the sorbet mixture before churning. *Because there are many different producers of sheet gelatin, various brands will vary in strength and size. Use what’s recommended by the company where you buy your gelatin sheets, or on the package, as the manufacturer best to advise on the correct usage of their particular gelatin. For those concerned about the detailed math of the conversion, there’s an interesting discussion thread on eGullet. For those of you who don’t want to get out your calculator, if you’re making a gelatin dessert that needs to be unmolded, err on the side of more gelatin. If making a gelée or spoonable custard, you can err on the side of less. Great post! I love learning about how things work – and don’t work. Thank you for your timely post. I can’t find the granules to buy in Vienna and bought a pack of the sheets to use…but haven’t had the time to translate the pack from Deutsch as yet. (GoogleTranslate and I are very good friends!) After reading your post I am pretty sure I now know what to do and will try them out today. Thanks for all the informaton. I learned it the hard way recently when making a Panna Cotta. This confirms what happened! Interesting post, David… though not vegetarian friendly! Knowing what’s inside gelatin and being a vegetarian, I prefer using a natural and vegetal gelatin called “agar-agar”. It comes from algae. It’s very powerful (much more than “traditional” gelatin) so you don’t have to use that much of it and it’s extremely simple to use it. For those of you who’d be interested in buying “agar-agar”, you can find it in wholefood shops (like “Naturalia”, in France). 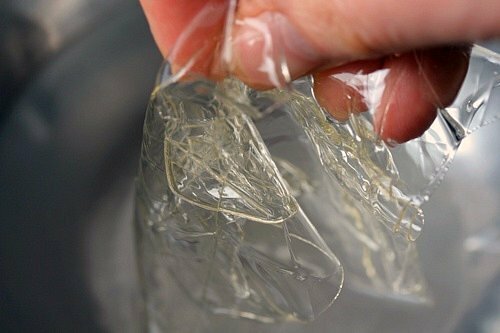 Hi Chtioleaf: Yes, there are vegetarian alternatives to gelatin, and there’s a link in the post with instructions for using agar agar. (Since the post is about gelatin, and not all gelling agents, I thought it best to stay on topic.) I know in Italy there is fish-based gelatin, but I don’t know if it’s available elsewhere. But believe it or not, I know people who put gelatin in foods and don’t tell guests, who may (or may not) be vegetarian or kosher. So I hope that people might realize that it’s imperative that if you use gelatin in your cooking that you’re aware of those on special diets. It’s true: My head has exploded trying to perform the high level calculus necessary to convert powdered gelatin to sheet. I would tell people to either stick to the type called for in a recipe or be prepared for some trial and error. Omg, thanks sooo much for this post, David! I was just asking around a few people about gelatin conversion between sheet and powdered. We get Halal gelatin here nowadays (in Southeast Asia) because of the demand, but once upon a time all we could use were agar-agar. 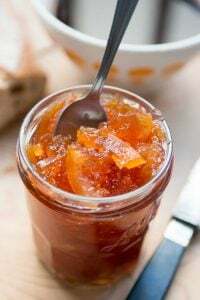 By the way, what is the difference between gelatine and pectin? I see some recipes requiring the latter. I’m especially grateful for the ratios for moldable/spoonable desserts. I’ll be referring back to this post often, I have a feeling. And using more gelatin! Camille: I had assumed that the sheet gelatin that you buy in the supermarket here in France was standardized. Then I compared the store-brand that I got at Franprix with the Vahiné sheets, which were about 25% bigger. Weighing is probably the way to go, although it’s hard to weigh two sheets of gelatin accurately. And yes i do believe that people use gelatin in foods and don’t tell guests because it happened to me several times! You wouldn’t believe how many times I had to explain why we, vegetarians or vegan, don’t eat gelatin! Thanks for the always useful tips. This was the most helpful blog post. Thanks for the tips and facts section. You are more than just giving us recipes to make but giving out building blocks on which to create a nation…no, a world, of better bakers. Thanks! Kosher gelatin in the US is a brand called KoJel and can be found in many supermarkets and kosher grocers typically carry it. It comes flavored and may also be available as unflavored as well. This also works for those who are halal as well. Thanks for the informative post! I’m always curious about these things. Also, I hadn’t ever thought about what gelatin actually was until I babysat a kid with PKU (can’t have protein) a couple of years ago. So, it’s very true that people may not realize and serve vegetarians gelatin. Interestingly, I also found out while babysitting that Hunt’s brand jello cups don’t contain gelatin. Wow, this is really helpful and informative =)! Thanks for the bullet point about the lifespan of gelatin. When I mom moved a couple years ago, I somehow inherited an economy box of Streamline brand gelatin packets. Is this brand even still manufactured? I swear it must be from at least the 70’s; in all it’s Aqua and Burnt Gold packaging brilliance. I admit that I actually have been using it. The packets were still granulated, didn’t smell off, and seemed to be working properly. It certainly made some stellar marshmallows last winter! Great post, such useful information! Thank you, thank you David!! Although this gelatin info is useful, (thanks!) I have an ice cream question… I’ve been working my way through your ice cream book and loving it and I notice that in a lot of your ice cream recipes you don’t heat up all the milk and cream, choosing instead to heat part of the liquid and then strain the custard into the cream. Is this simply to cool the custard faster, or is there another reason for it? Thanks so much for this post- I needed to write one like this for my readers, but I think I’ll just end up linking to yours! Also, I’d like to thank those who commented with additional sources of gelatin that can be found. This information will certainly be very useful in my kitchen! Great timing. I’m in the process of creating an art project involving jello, sound and video, with some friends at M.I.T. I will give you details when we are close. Gelatin used to be a deal-breaker for me….Thanks for all the great info! I’ve been a devoted reader for years, but I’ve never commented on your site before. I just had to thank you for this post. Just a couple days ago, I spent an hour scouring the internet for info on gelatin, without finding the answer I was looking for. This post was by far the most useful piece I’ve seen on how to use gelatin in various desserts. Thank you! And thank you for a wonderful blog; it’s always useful or funny and often it’s both. I’ve been switching gelatin sheet sizes because of the purveyors. However I’ve found that most of them are roughly 2 grams weight. Regardless of size (Smaller ones tend to be thicker). So 3 and a half would pretty much be around 7g. If I’m not mistaken that’s pretty much what packets measure. I’ve shied away from gelatinized desserts before, not any longer. What gorgeous photographs of the sheet gelatin, David! That first one is just captivating. Reminds me of a picture window. Thanks for a very helpful post, beatifully packaged. Thanks for the info. I’ve always been scratching my head over the differences between platinium and gold gelatin leaves. Now, I know the difference! By the way, can I keep the leaves after the expiry date? And if yes, how long can I store them for? Allen: It’s interesting because I never noticed the smell of powdered gelatin until someone pointed it out to me. It does tend to gel a bit more stiffly, but I use it because that’s what’s available in the states. But I do like the sheets, too. THANK YOU!!! I got all excited about trying sheet gelatin and then every single recipe calling for gelatin I wanted to try called for powder. This really had nothing to do with baking, but it’s new info for me and I HAD to share. Did you know that synchro swimmers use gelatin on their hair to keep it slick and shiny all through the swimming? And apparently, the term is “knoxing”, as in: “I need to knox my hair before the semi-final round”. Thanks David, for all the wonderful info that you share! this is great! i don’t know how i missed it earlier. i get that question asked a lot. from what i have researched 1 gram of sheet gelation usually equals 1 gram of powdered gelatin (at 200 bloom). this doesn’t help many people though as most don’t use grams anyway. so i am bookmarking this david! Thoughtful and informative as always, David! I have a few questions about the use of gelatin in cake batter, specifically, in a Rosalyn Carter Strawberry Cake made from scratch where powdered gelatin is mixed with batter. From cobbled research, it seems that gelatin may be used to make a cake more elastic, keeping the top from splitting as it bakes. But does the gelatin also cause the cake to become more dense as a result? Or is the density that reviewers of the from-scratch cake speak of due to the use of cake flour and softened butter (vs. self-rising flour and clarified butter)? Gelatin, I’d like to harness your strange magic … Heartfelt thanks for your advice! This is the most informative article I’ve ever read about gelatin. Thanks for such a wonderful post, I’m going to save it in my archive right away! Thank you for the informative post. My panna cotta is chilling in the frigde as we speak! I’m living south of you, in Toulouse, and couldn’t figure out exactly how to use the gelatin sheets. Merci encore! I realize I’m very late to this, but I have a question. All the gelatin sold here in Germany is pork, so all the recipes I get from various non-Jewish sources use that. I, however, use kosher gelatin (fish) instead and have noticed that my desserts end up being quite soft (I weigh my ingredients, so I don’t think it’s a measuring error). Is fish gelatin just generally softer/weaker than the one made from pork? Thanks for the help. Julia: I’ve not used fish-based gelatin so I can’t advise. But gelatins do come in various strengths and it sounds like yours just isn’t strong enough. If you don’t eat pork, you might want to try agar-agar, a seaweed-based gelatin. You can find it in natural food stores. I don’t have much experience with it, but the link at the end of the post should help. I do pretty good now with the gelatin. But the first time I tried using the granules it said to wait about 5 minutes. By that time the gelatin was really really gelled. I didn’t use it and started over. So the next time I saw that it was completely dissolved in practically a minute. So now I am apprehensive when the recipe says let sit for 5 minutes. It will likely turn into a mass of jellied granules, which is the point-you’re trying to get them to absorb all the water and swell up. Those jellied granules should melt easily when heated. I want a softer pudding, so I need to put more or LESS gelatin on it? Adam: Generally speaking, yes. For puddings, if your recipe also had cornstarch or another thickener, you might reduce that. I am making marshmallows, and the recipe calls for gelatin sheets, but after you wring them out you simply heat them until melted without adding any water. To substitute packets should I just add the granules to the water, let it sit for 5-10 minutes, and then heat until melted? To use granulated gelatin, you sprinkle it over the surface of cold water (or liquid as indicated by the recipe), wait 5 minutes, then use it as the recipe indicates. Fantastic article! You are the best David! David, this gelatin instruction manual is the best. Thank you. I have been trying to perfect a coconut milk panna cotta and its been a hit or miss in terms of it setting properly. You notes and expertise are greatly appreciated. It was great to meet you at food blogger camp and I hope I have the opportunity to talk shop with you soon.